I love this deal we found on Amazon! Decorate for a wedding, a party, or even just add style to your backyard! Hurry and get the Outdoor String Lights Commercial Great Weatherproof Strand Dimmable Edison Vintage Bulbs Hanging Sockets, 24FT UL Listed Heavy-Duty Decorative Café Market Patio Lights for Bistro Garden Porch today for only $28.99 as low as $14.49 from Amazon when you use promo code 9DJ9X33Q at checkout! (Limit 2!) Check out all of the Amazon deals here! [WEATHERPROOF & HEAVY-DUTY] This market lights are UL listed weatherproof commercial. The insulation material can protect the strand from hot winter, sun, wind, rain, snow and damp. Flexible heavy-duty cord withstands the wear of indoor and outdoor use. [IDEAL OUTDOOR LIGHTING] Each strand contains 8 E26 based hanging sockets, provided with 10 pack of 11W S14 incandescent bulbs (included 2 extra bulbs). The distance between bulbs is approximately 2.79FT. This Heavy-duty light is bright enough and ideal illumination anywhere. [SMART INSTALLATION] Each socket has hanging hook above, makes it easy for hanging with hooks, guide wires, or zip ties. 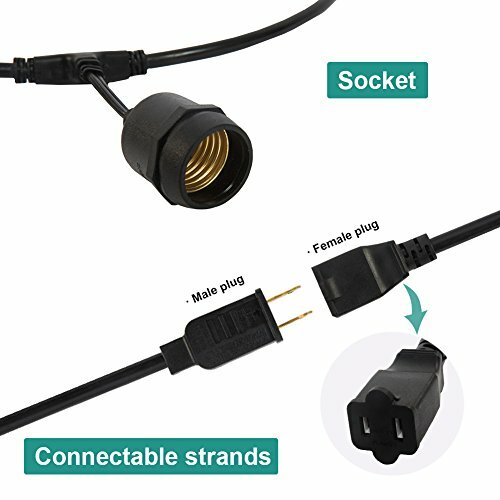 It can connect with another simply use grounded cord plugs into any standard outlets. Link up to 10 strands. Buy the Outdoor String Lights Commercial Great Weatherproof Strand Dimmable Edison Vintage Bulbs Hanging Sockets, 24FT UL Listed Heavy-Duty Decorative Café Market Patio Lights for Bistro Garden Porch from Amazon.